I'm a regular shopper at Kroger and when I heard I would be able to get free snacks from Kroger through BzzAgent, I was excited! They gave me free coupons to go to Kroger to pick up my free snacks! Back to school started for my daughters a few weeks ago, so this Bzz campaign comes in handy to save money on filling up my daughter's lunch boxes. 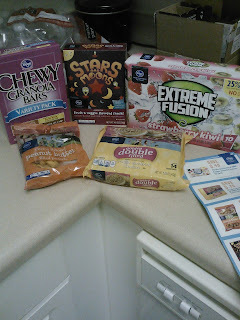 A few of the snacks my family and I already tried before, so I already knew the taste of the snacks I had to review. 1. Kroger Snack-Size Cheese Flavored Peanut Butter Filled Pretzels- These bite size peanut butter filled pretzels are good and fit perfectly in my daughter's lunch boxes and good for a on the go snack. 2. NEW Kroger Golden Double Filled Vanilla Sandwich Cookies- These cookies reminded me of the vanilla Oreo cookies and the Kroger brand was just as good. My oldest daughter loved it but my youngest only liked the double filled icing in the center and she just ate that and threw away the cookie parts. I really liked these cookies and will buy some more in the future. 3. Kroger Extreme Fusion Waters- My daughters had these flavored water before and really enjoys it and so do I. Great thing about this drink is that when you have a spill, it leaves no mess! Also what's great is that it has 25% less sugar and no artificial flavors, colors or preservatives! 4. NEW Kroger Fruit Snacks- These fruit snacks is made with real fruit and vegetable juice. I didn't tell my daughters that it had vegetable juice in it or they wouldn't have tried it. When they tried the fruit snacks they really enjoyed them and wanted more. I also enjoyed the fruit snacks too and can't tell it has vegetable juice in it. 5. Kroger Chewy Granola Bars- I've tried Kroger's variety granola bars pack several times and I still enjoy them! My favorite flavor is oatmeal raisin. Other flavors are chocolate chip, peanut butter, and s'mores. Are Kroger Brand Snacks Worth a Try? I love Kroger and I love their products because it taste just as good as the national brands without paying the national brand price. Kroger brand snacks is definitely worth a try!